In this modern age, having a website that conveys your message well while looking great and working on mobile devices is important. Creating a site yourself can be time consuming and may not give you the results you really want. Your time is valuable, and it can be better spent on what you do best. That's where we come in. Think of us as your "personal site builder." Sort of like a personal trainer, but instead of working on your body, we work on your company's public image. While having a great website is important, sometimes you need printed pieces. Maybe it's a brochure, or a conference program guide or a special marketing mailer. Sometimes you just need a new eye or a fresh idea to kick start your own designs. We can help you plan, design and execute printed pieces that get attention without losing your message. Anyone with a copy of PowerPoint or Keynote can put together a presentation. You might even get a nice template as a starting point. But putting together a truly great presentation is as much knowing what not to put on a slide as it is know what to put on a slide. Let us upgrade your presentation, create a brand new one, or even create a custom designed company presentation template for you. You've got a fancy, dynamic website...now what!? Let us help you keep it up to date, backed up and secure. We offer several maintenance packages that include keeping your site up-to-date, running off-site backups and monitoring for malware. We can also custom design a package just for you. We build most of our sites using the Joomla! CMS or "Content Management System." This is a fancy was of saying that your site is built with a system that lets YOU manage it from a web based dashboard. We create the site and teach you how to manage it. You can update text, add pages, even upload photos all through your web browser. We prefer to use Joomla! but can also build with Wordpress or a newcomer called PageKit, which is great for smaller sites. We're also open to investigating other systems if you have one you like. Over the last few years we've put in hundreds of hours of time in building Moodle sites. If you're looking for a powerful online learning system with loads of features, Moodle is a great tool. We also have experience building hybrid Joomla! 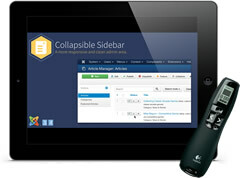 - Moodle sites where you get the best of both worlds in one site. While eCommerce can be very complex, there are ways to make it easier. We work to find the right fit for you. We've worked with Opencart (a stand alone cart), Woocommerce (a Wordpress cart), Quick2Cart, J2Store, and Mijoshop (Joomla carts). Let us know what your needs are and we'll find the right cart for you. If you've got an older Joomla site, and you want to hang onto the content while upgrading to a new site, we can take care of that. We can clone your old site, create a new site and then migrate your content from the old to the new. Depending on your original template, we can even make your new site look like your old site. We don't just make websites! We can handle your printed pieces too. 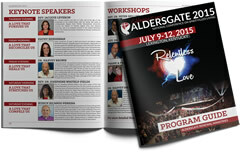 From business cards, to brochures to newsletters and conference program guides. We can handle just about any print job. We can also help you with branding and logo design. Need some help managing the A/V at your conference? Intimated by the thought of doing your first webcast? Need a podcast or DVDs created from your conference sessions? We can handle it! We've also got an extensive background in preparing Presentations for many of our clients. While we love to work in Apple's Keynote app, we can also clean up or create PowerPoint presentations for you. If you're ready to start talking about your web, print and presentation needs, give us a call at 614-946-8989 or email us at . We also offer Event Services. If you need help with tech at your event, want an expert on site or or just want help negotiating and sorting out what to order at your venue, we can help. We can even come and run your projection or webcast so you don't have to.